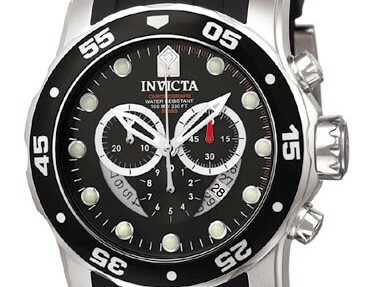 With commanding yet classic styling, the Invicta Men’s Pro Diver Chronograph 6977 would easily appeal to most guys looking for a diver watch. The stainless steel and black ion plating catch just enough light to show refinement but are subtle enough to keep it masculine. This timepiece is truly built for both work and underwater play. The face has a sunray polished black dial that’s complimented with metallic hands, numerals, hour markers, and calendar windows. Another handsome touch is the singular splash of red on the right sub-dial hand. This medium-sized 48.8mm stainless steel case is covered with scratch resistant flame-fusion crystal and framed with an aluminum unidirectional bezel. The silver and black theme continues along the band, where brushed stainless steel and black polyurethane are interwoven. 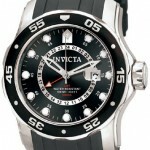 The Invicta’s Pro Diver is a muscular collection built around performance. 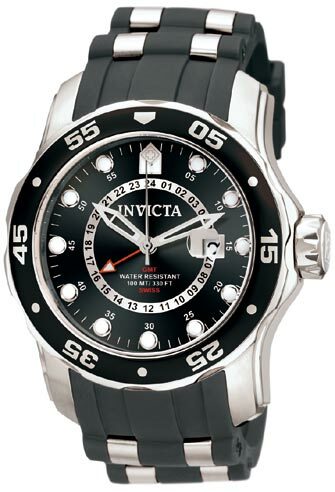 That means, even though the Invicta Men’s Pro Diver 6977 will take you 100 meters deep, some models of this same collection even navigate at depths of up to 300 meters, offer shock resistance, and are powered by 21 jewel automatic movement. But if you don’t want all the bells and whistles you’ll save a little money with this one. There are also a number of additional color options, including blue, white, red, green, orange, and yellow. A slightly different option pictured below has similar features, but does away with the extra dials if that’s a look you prefer. 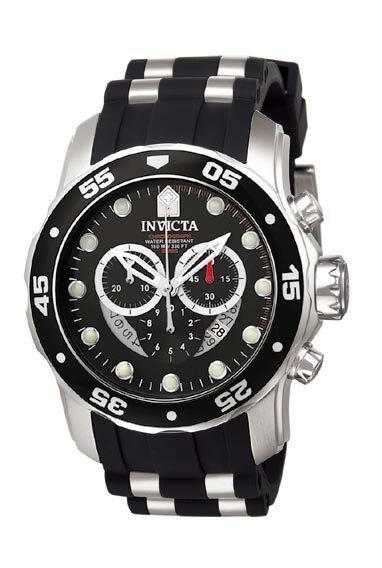 The Invicta Men’s Pro Diver 6977 retails for $795, but I found it marked down to $150 on Amazon. For that price, it’s a great value. It’s movement is professional Swiss quartz. It looks sharp. And it has all the chronographic features you’ll ever need. There are, however, other watches in the collection that offer even more, such as deeper water resistance and shock protection. The value for the dollar is there with this piece of equipment. The only question is whether you’re a more serious scuba diver and want something that will go even farther. If that’s the case, I’d look at the more high-end watches of the collection.